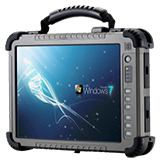 Winmate's 12.1" ultra rugged tablet pc automates warehouse efficiencies enabling users to increase material handling, reduce costs associated with handling delays, and streamline the supply chain. 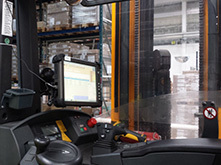 This device can be securely mounted inside a forklift with a customized vehicle dock, providing forklift navigation and the exact location of any piece or product throughout complex ecosystem of the warehouse. Mounting a device on a forklift is a rigorous and challenging environment to operate in; the device must withstand shock and vibration all day. 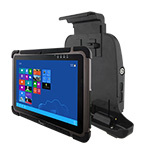 Winmate offers the R12ID8M-RTM7GP for streamlining efficiencies in your warehouse operations. In a warehouse environment, fast and accurate information is crucial to maintaining efficient operations. 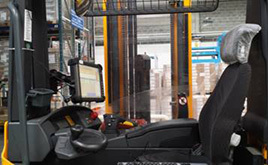 With an external barcode scanner, the R12ID8M-RTM7GP allows the forklift driver to track the products location, incoming and outgoing shipments, while storing and monitoring inventory information in the warehouse real time. This allows warehouse staff to check a shipment's location status and locate inventory records instantaneously. Advanced communications options such as WiFi, Bluetooth, and optional 3G enable records to be updated live, ensuring the most up-to-date information is always available.